Yelo may be known as "the napping place" but let me make it clear - Yelo offers their visitors a unique body, mind and spirit experience that is so much more than just a few moments of shut eye! This place is styled and poised - and when I was invited to have a treatment with Head Therapist Anna Crean-Weiner, I learned that Yelo really is a dream of a place that connects with each person that takes the time to feel better. I saw that Yelo thrives by being sophisticated and welcoming, detailed and patient. Yelo also makes it clear that providing options is what makes a session perfectly designed to the individual. They offer choices in a way that's exciting - not intimidating. During my session with Anna, I also learned that this sanctuary of relaxation has healing energy at the very heart of it all! From the minute I was welcomed into their world, I knew that Yelo is dedicated to helping You be a better You! Sight: Yelo is like no other venue I have been to. It is an amazing blend of modern - even down right spacey - and a warm comforting hug! In the lobby, you will find multiple cards of information based on the benefits of a Yelo appointment: Relax, Renew, Sleep, Energize and Detox. Each card giving you facts, how Yelo can help - and details on how to take that advise home with you! There are hand picked books and products for sale, with no pressure to buy. Just the space to see if anything reaches out to you.The pink that is the base of their decor, is one of the colors in a simulated sunrise used to gently nudge you out of a nap in the private Yelo CabTM. 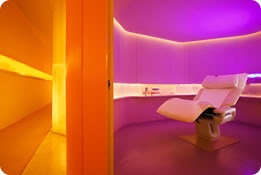 A YeloCabTM is a specifically designed treatment cabin - where a client can choose the colors that best suit their needs. The YeloChairTM sits in the middle of your spa pod "which reclines deeply to keep your legs elevated above your heart, so that your pulse slows down. This produces a feeling of weightlessness, which encourages full relaxation within minutes". True as advertised, this chair's position takes the stress off your back - letting the spine breath tall and strait. Making your inhale feel fresh while circulation is encouraged through out your whole body! Sound: Choices! The intake form gives you a chance to choose from 14 of their own suggestions (From Ocean Waves, Vivaldi Opera, Chopin Piano to White Noise) or you have the chance to plug in your own personal ipod play list. I went with the Yelo collection titled Nap - which can be described as a soothing mix of low base rhythms, chimes and string instruments. Smell: More choices! Out in the lobby you have a testing station to help you pick between: Sleep, Detox, Calm and Refresh. Your intake form explains the ingredients of each, so you can learn which scent is intoxicating you! I chose Sleep (which blends Lavender, Cedar Wood, Marjoram and Ylang-Ylang) The scent was then dabbled on a towel for me to breath in before Anna started her body work. Taste: Choices again! Yelo is the first place I have been to that is sensitive to the fact that hot tea - may just be too hot to drink while waiting for your turn at bliss! They offer tea high in antioxidants - both hot and at room temperature. Water is also given at the end of a session for re-hydration. Touch: Yelo starts their touch with you by bringing a hot towel for you to clean your hands from the city travel. This small gesture tells me that I am allowed to get into "exhale and take care" mode. A simple, but important mind shift. A clean blanket is place over my fully clothed body when I get settled into the The YeloChairTM, another detail that helps me feel like this time has been very well thought out by the operators of Yelo. Understanding that Yelo is known for it's Napping and Reflexology - but knowing that this company has even more to offer by way of Massage, Healing and Health - I asked Anna for my 20 minutes of body work to be on my Head, Neck and Shoulders. The music began, my YeloChairTM moved into full relaxation and Anna began her beautifully detailed work. From the moment she placed her hands I me, I felt a difference in her touch. I have been places where I felt as if the practitioner was skilled and took time to listen to my body - yet Anna's hands felt like they were doing the listening. There seemed to be a buzz of warmth and positive energy dancing between her hands and my body. I could tell that Anna was addressing all the muscles involved in my upper back tension, communicating with them to relax...breath...take a break and heal. When she moved on to my ears, there was another shift. Her reflexology knowledge was incorporated, and one of the points she used sent a wave of release though my body and very busy brain. While receiving bodywork, there have been few times I have felt this kind of moment - a moment that truly makes me believe the energy from one person to another can change you. Anna's energy was helpful, focused and nurturing - and this is just one of the many things that makes Yelo so much more than "the napping place". Loved: The fact that Yelo gives you the sense of luxury you find in a big product pushing spa but treats every clients as if THEY are the treasure! I love that in the center of this designer environment - the foundation of each session is built on making sure clients get a custom made experience - then be guided into healing body work by people who believes in the work that they do. Learned: You can give impactful treatments in a beautiful and progressive setting, and not loss any sight of the healing body work. Yelo has offered much support to Mending Hands - so stay tuned for a Meeting of the Massage Minds with Head Therapist Anna Crean-Weiner, updates and more!